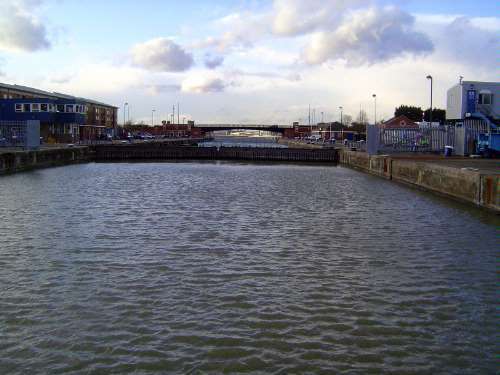 The old basin docks were inadequate by the mid-19th century. What would replace them? Here's the answer in map view. 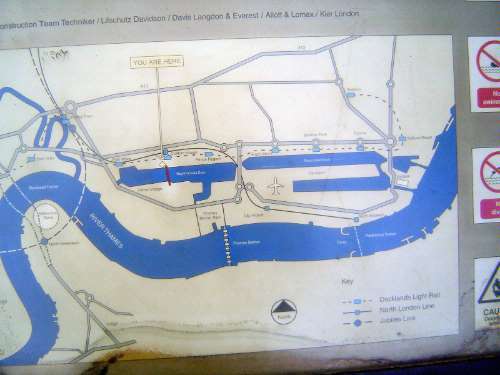 The East India dock can just be discerned west of the mouth of the Lea and across from the dome. 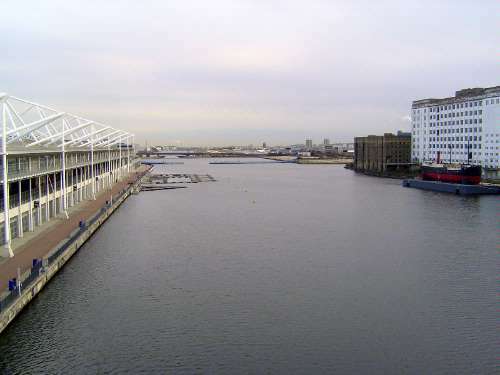 The replacements were the three royal docks: on the left, Victoria from the 1850s; to its right, Albert from about 1880; south of Albert, George, opened in 1921. 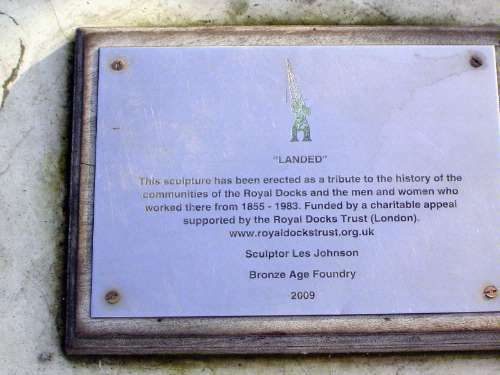 Ships originally entered the Victoria Dock from the west, but that entrance was closed in the 1940s. 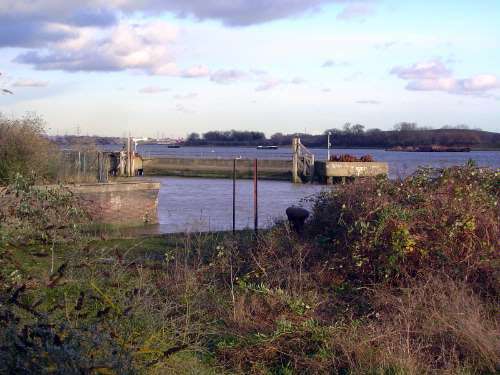 The entrance to all three docks was then from the east. (There's a narrow channel between Victoria and Albert). 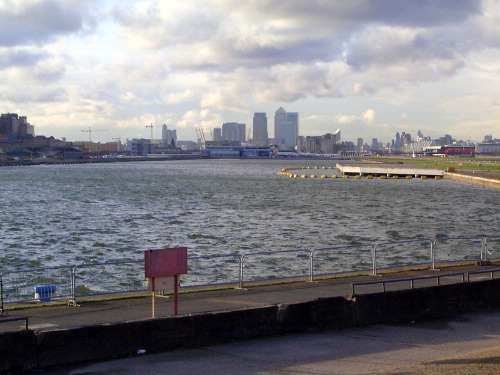 That came to an end in 1983, when all three docks closed. Container ships today unload at the Tilbury Docks, about 15 miles downstream, or even farther away at Felixstowe, a good 50 miles farther along the coast. 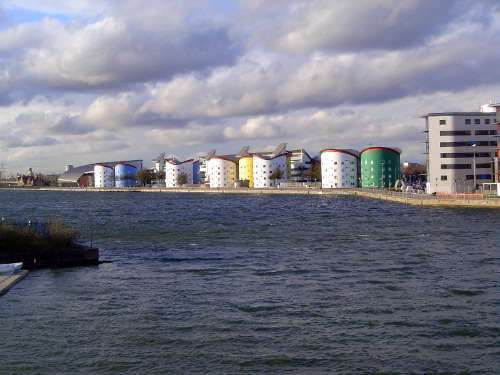 So what to do with these box-shaped lakes? 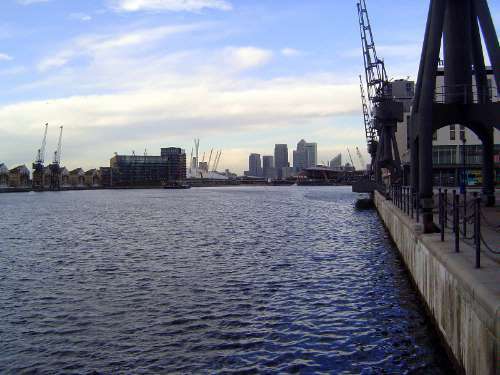 A waterside view of the Victoria Dock, built in 1855 by the Victoria Dock Company but purchased in 1864 by the London and St. Katharine Dock Company, the same company that went on to build the Albert Dock in the 1870s. 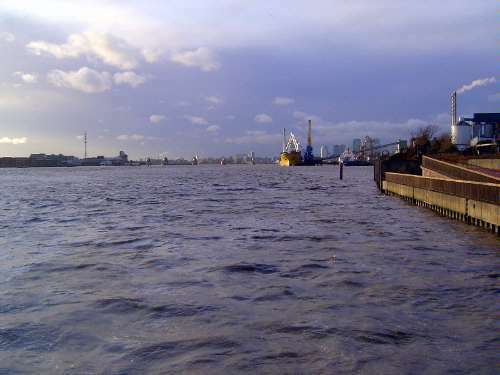 There are 94 acres of water in the Victoria Dock alone. 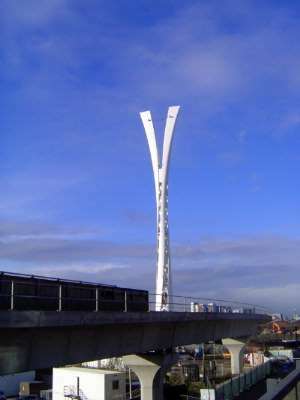 The cranes, merely decorative now, were added in 1962. It's easy to see the dock because of this spectacular bridge completed in 1999 and designed so yachts could pass underneath. Zooming east from the midpoint on that bridge, the camera takes in the Albert Dock beyond the bridges. 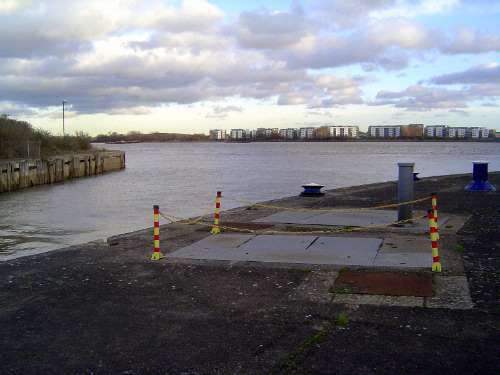 The London City Airport opened in 1987 on the strip of land between the Albert Dock and the King George. Still from the bridge and still looking east. 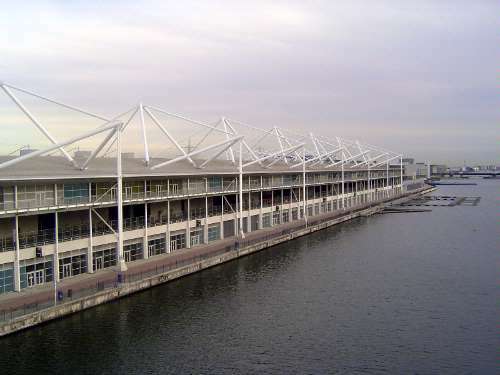 The building on the left, with a very busy roof, is the 90,000 square-meter, column-free Excel Exhibition Center. 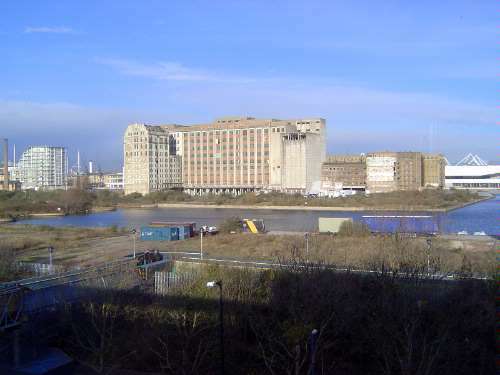 On the right, the hulk of the long-defunct Millennium Mills. The exhibition center, in Pevsner's words, is a "waste of peerless waterside setting" (5; 297). 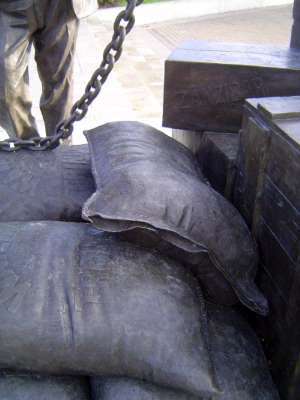 Not that the old port was a model of efficiency, at least by today's standards: vessels were allowed six weeks to unload before incurring demurrage charges. Still, the docks had a long life. 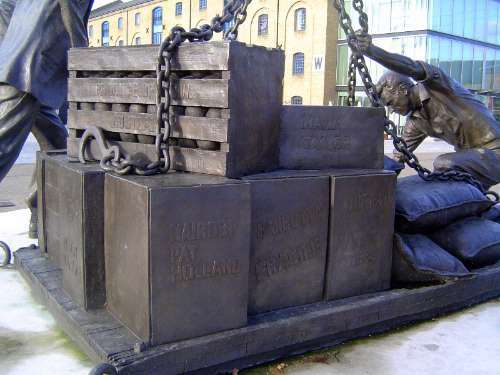 In 1947, John Herbert, in The Port of London, wrote that these docks were "the centre for all trade entering the Thames." He singled out American tobacco, Australian lamb, New Zealand butter, and Argentine beef as especially important. He continued: "Rising amid the forest of masts and derricks, the funnels and flags of many companies and countries brighten with their colour a scene which must impress the most impassive heart; among the Company flags, those of the Blue Star, Cunard, Peninsular and Oriental, Royal Mail, and Shaw Savill Lines are especially prominent." 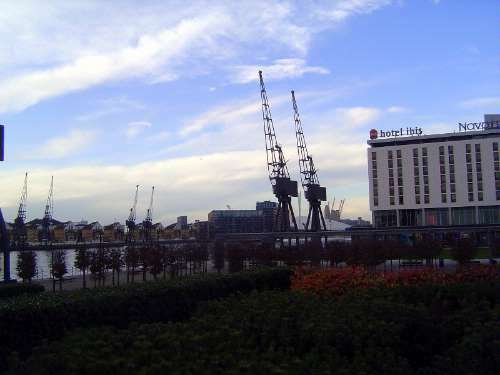 To the west, a cluster of hotels depend on the exhibition center and may even get business from the O2 arena, seen in the distance but tricky to get to from here until 2012. The Millennium Mills again, this time with the curved block of the Crescent flats. Looking west from the bridge toward Britannia Village on the left, apartments and hotels on the right or north. 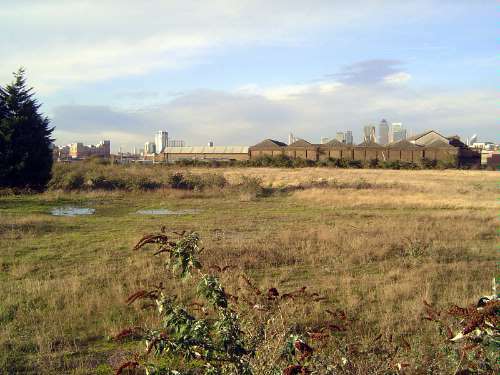 The highrises in the distance are part of Canary Wharf. 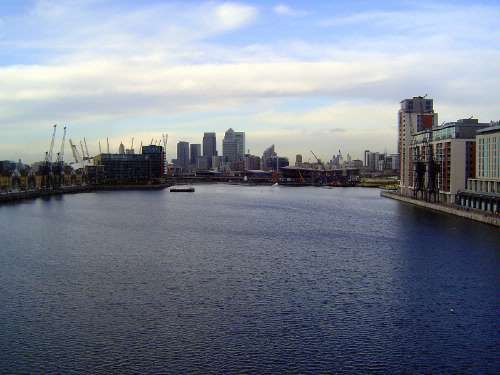 Britannia Village was conceived by the Docklands Corporation in the 1990s as a self-contained community. Again, the cranes are reduced to sculptural objects. 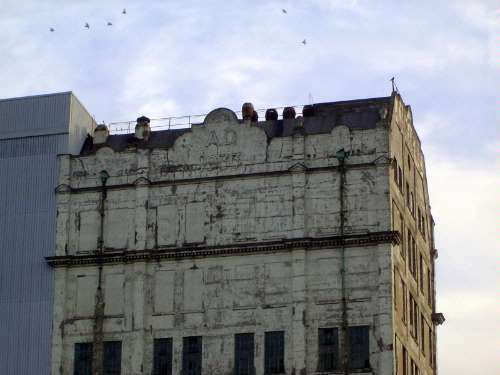 A gabled wing of a secondary building of the Millennium Mills. The date is 1933. 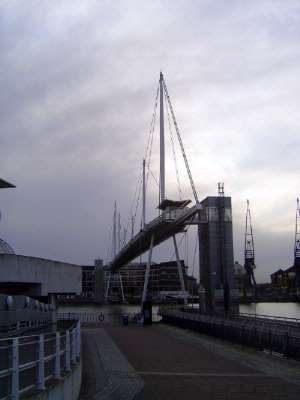 We'll walk from the bridge over to the Thames, then circle counter-clockwise around the dock and back to our starting point. 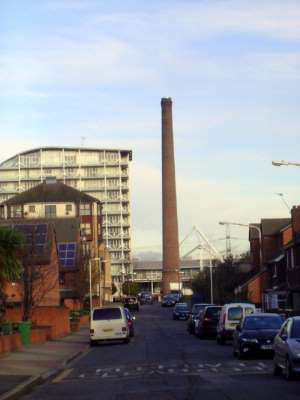 Here, the surviving chimney of the Empire Mills, from about 1950. 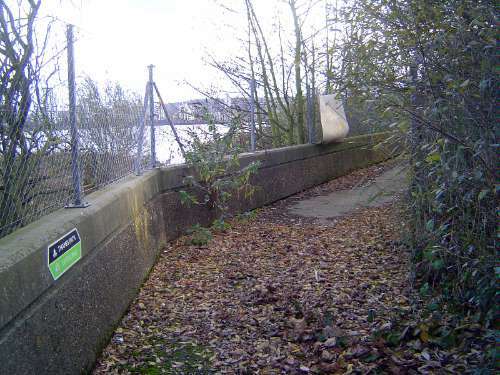 This is the Thames Barrier built to protect the city from surge tides. 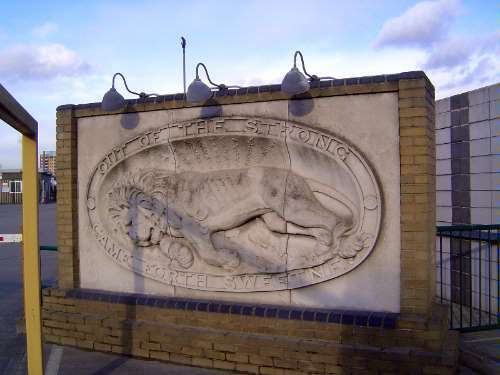 Pevener writes that this is "one of London's most ambitious civil engineering works, mostly hidden below water but with sculptural shell-like roofs of machinery rooms." Completed in 1982, the gates rotate up from the bed, where they normally lie. When up, they form a vertical wall 66 feet high. 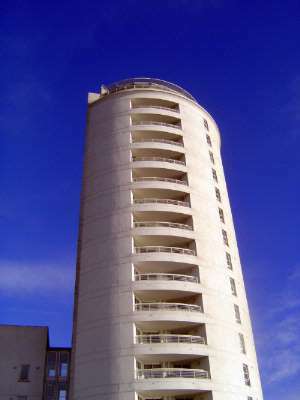 The Barrier Point apartments of 2001, very reminiscent of London's early 1930s architecture. From the same point on the river but this time looking upstream. 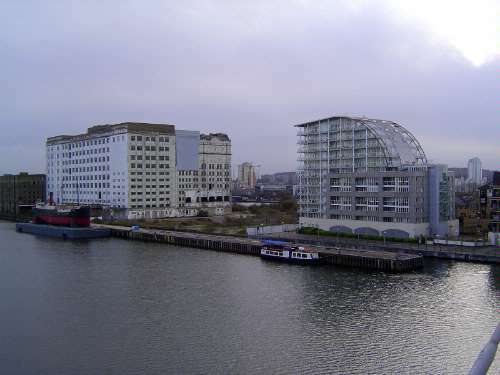 The view north toward the Millennium Mills. 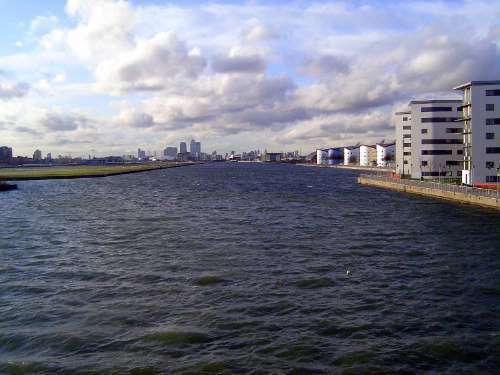 The water here is an L-shaped branch of the Royal Victoria Dock. 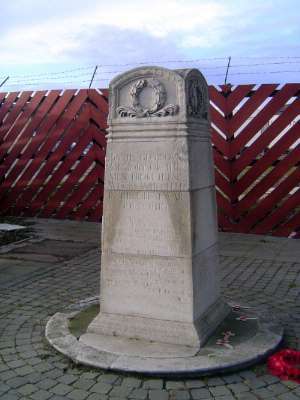 A reminder of World War I. 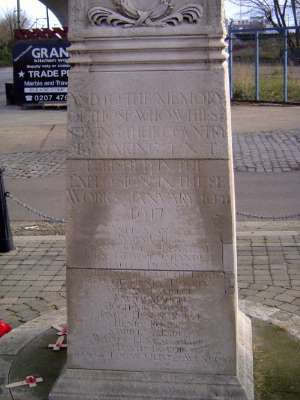 "And to the memory of those who while serving their country by making T.N.T. perished in the explosion in these works. January 10th, 1917." Fifty tons of it exploded, killing 73 and injuring several hundred. 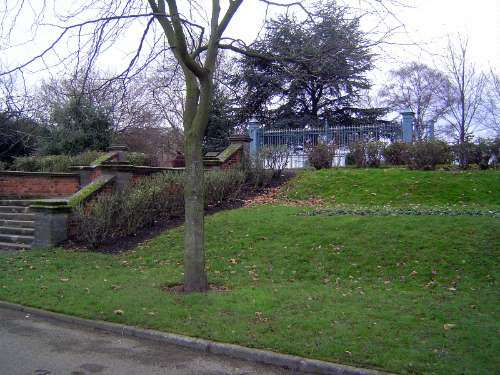 Lyle Park is nearby. 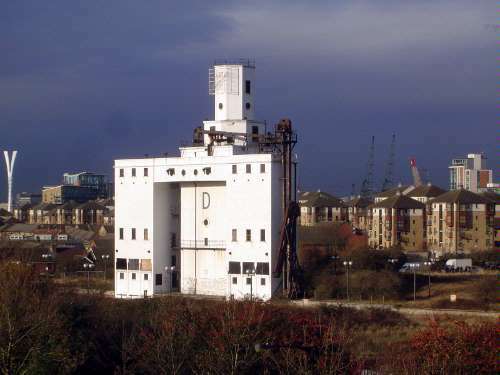 The land was given by Tate and Lyle in 1924. 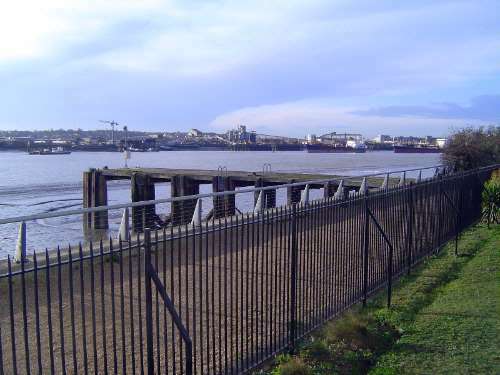 The gates were placed here in 1994 and previously were at the entrance to the ship repair yard of Harland and Wolff, a major shipbuilder based in Ireland and the builder of the Titanic. 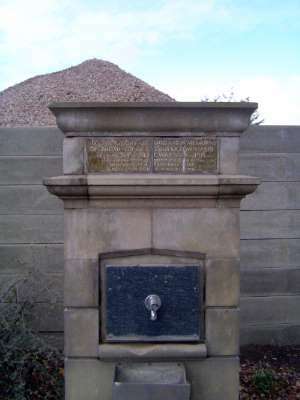 A war memorial water fountain in the park. 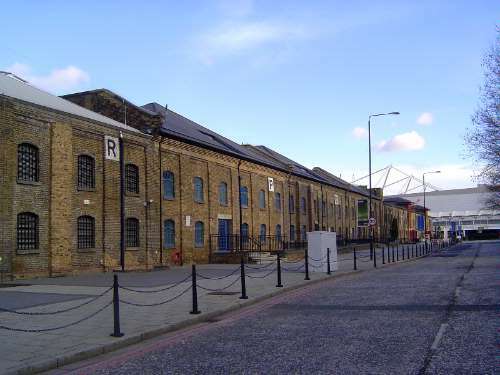 The entrance to a Tate and Lyle refinery. The company's emblem comes from Judges 14. 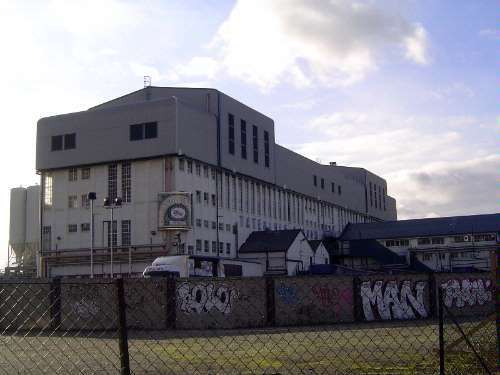 The plant began operating in 1903, while Tate and Lyle were still separate companies. 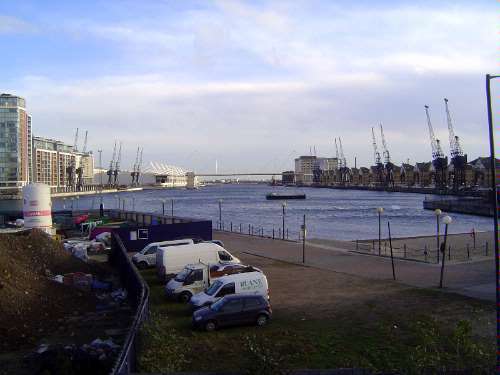 The Docklands Light Railway runs across the bottom of the image. And the tower? 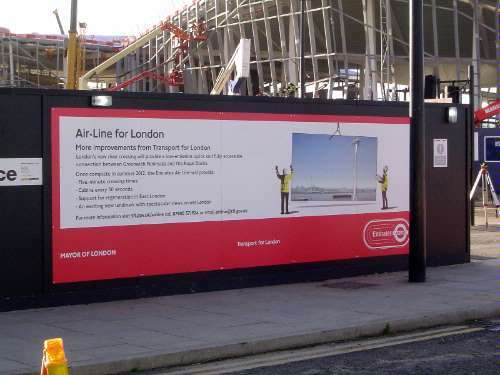 A sign explains the cable-car system that will use the tower to cross the river and provide a link for pedestrians crossing between the Greenwich Peninsula and the Excel Center. Emirates, the airline, paid 36 million pounds for naming rights for 10 years. 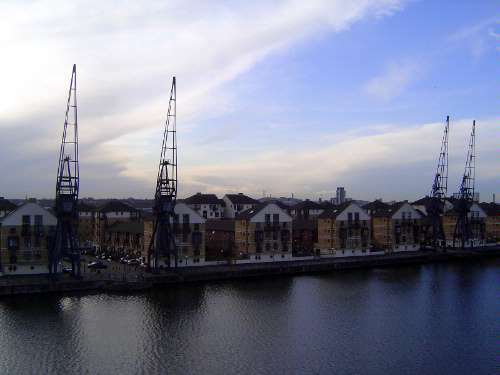 This link should help dockside hotels capture out-of-towners attending events at the O2. 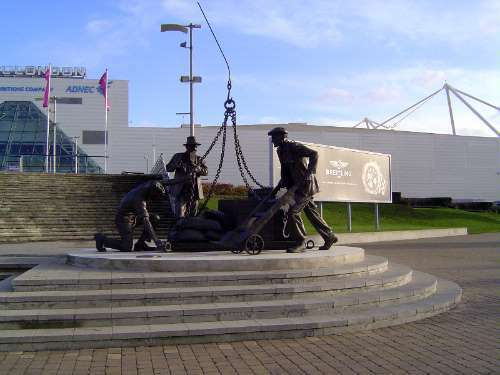 The original or west entrance to the Victoria Dock was at about this point until filled in the 1940s. 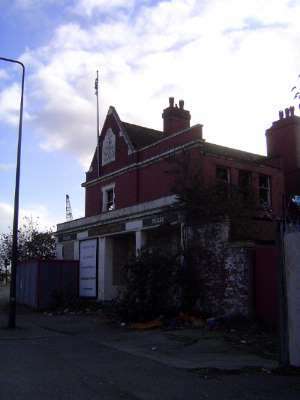 A survivor: the Tidal Basin Tavern marks the old entrance. The cranes do improve what otherwise would be a tedious waterfront. Behind the new apartment buildings are several old warehouses. Those named K through S were built in 1859 for tobacco. 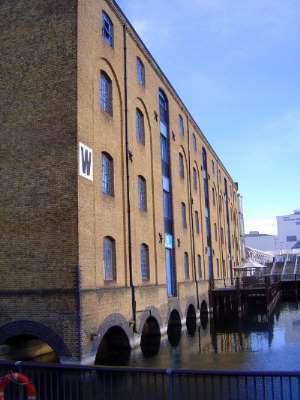 The W Warehouse, built in 1883, was converted to flats in 2004. A reminder of the past. Marginally better than a plastic sign. Dig out the atlas. Zanzibar? Trinidad? New South Wales, Nairobi, Durban. Any wonder why containers replaced pallets and slings? We've moved down to the east end of the Albert Dock. 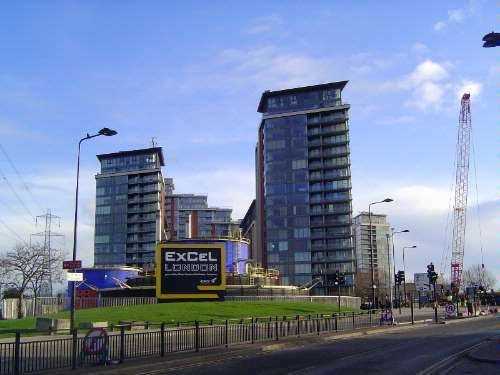 The buildings on the right are part of the University of East London. Residence halls, starting with Longbridge, then mellowing out to cylindrical Kwame, Jamila, Felix, Clare, and Alyssa. The halibut-slice is the business school. 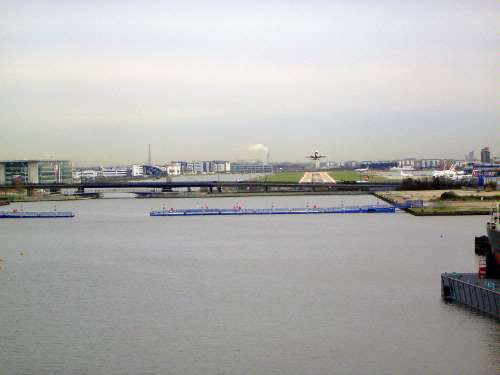 The view east across the Thames and along the flight path. The airport serves European destinations with the exception of one premium-class-only BA flight to JFK. 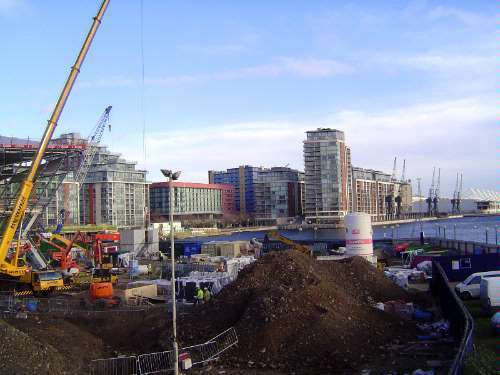 The view west across the King George Dock, smallest of the three but not so very small. 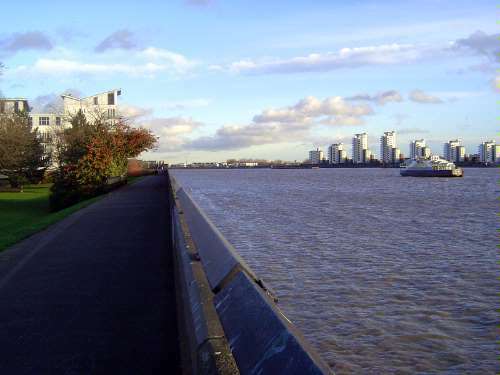 A path winds around the river's edge. 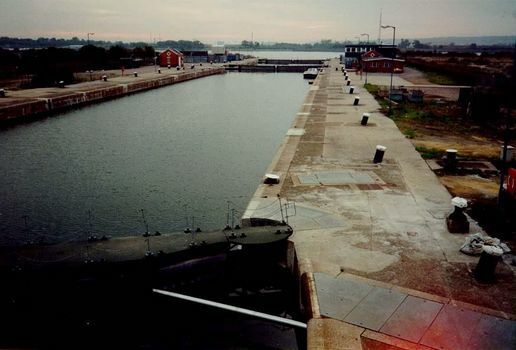 The entrance to the Albert Dock. 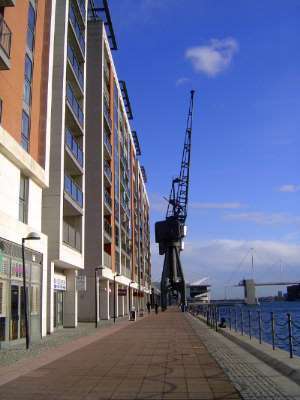 The entrance to the King George Dock. 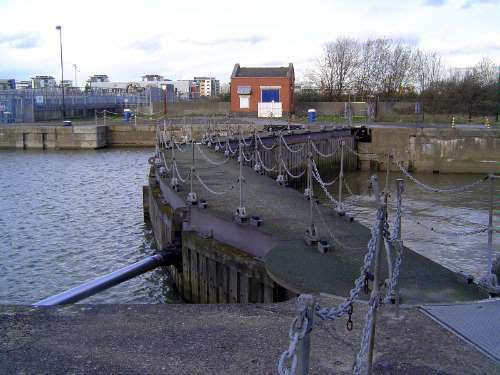 Miter gate at the entrance to the King George Dock. The lock here was big enough to hold the Mauretania. This is the "before" shot, taken in the late 1980s. 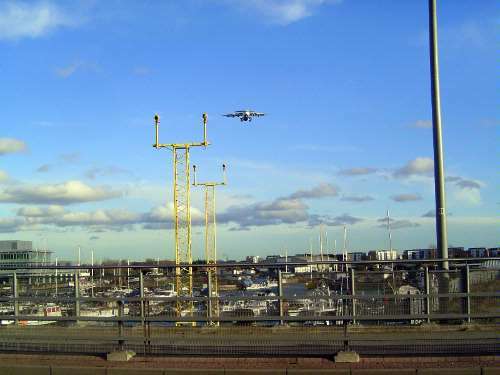 The land to the right side is now residential. The view of the river from that residential neighborhood. 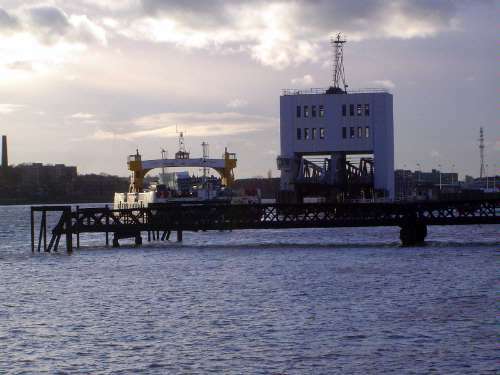 A ferry pulls out of the North Woolwich station. 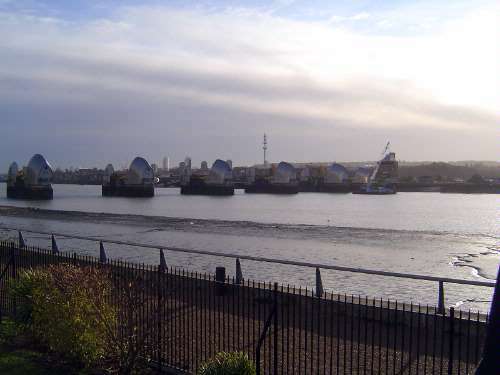 The view upstream to the Thames Barrier.